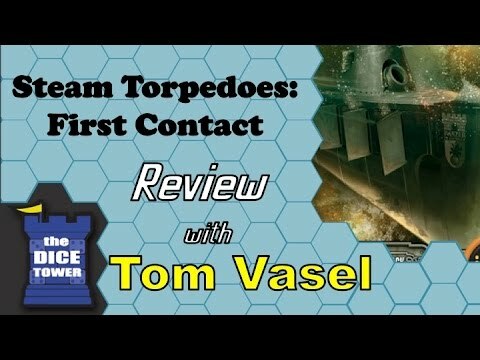 Steam Torpedo: First Contact is a game of underwater battle tactics for two players, with each game lasting 30 minutes on average. Before facing his opponent, each player builds his or her own submarine by selecting ten tiles to outfit the different compartments. Shielding, faster engine or firepower: each submarine will thus be unique, and players will need to develop their own strategy! On the game board, each submarine is represented by a cardboard cutout indicating its position relative to the enemy (front, back or side) and distance (in contact or away). During the battle, players use their five crew members to enable the compartments of their submarine. Various effects can be triggered, in particular to inflict devastating damage to the enemy submarine. A player wins by destroying the control room of the opposing submarine or by eliminating all opposing crew members.